Pipes wear down. Water heaters break. Plumbing fixtures leak. It’s not a question of “if;” it’s a matter of “when.” According to the Environmental Protection Agency, the average household’s leaks can account for nearly 10,000 gallons of wasted water each year. 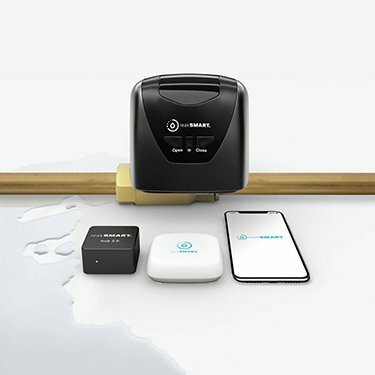 And with leaks in your home equating to roughly 10 percent of your water bill, having a smart home product, such as a leak and flood detection and prevention system like the LeakSmart Pro, will help protect your investment and provide peace of mind. Thankfully, the LeakSmart Pro system has only four components that are easy to use and easy for your technician to install. Shut-Off Valve – The automatic shut-off valve is attached to your water main. When there’s a leak, the sensors will send an alert to the shut-off valve, which will then turn off the water, all within five seconds or less. Sensors – You or your technician can place the sensors near fixtures and locations that are likely to experience a leak–bathrooms, basements, HVAC units, washing machines, sinks, toilets and more. When the sensor detects a leak, it will send notifications to the shut-off valve and the hub. Hub – The hub is the communication center. It will communicate all the details to you during the event. And thanks to its built-in WiFi capability and the secure Zigbee radio frequency network, the system will still work, even if your internet connection goes down. LeakSmart Pro Phone App – Install the LeakSmart Pro app on your Apple or Android smartphone to set your notification preferences (email, text, push notification) and monitor any warning notices. All of the LeakSmart Pro components have built-in rechargeable batteries, meaning even if the power goes out, you can still prevent a leak from causing major damage. If the rechargeable battery is running low, the app will warn you. Leak detection and prevention systems are perfect for homeowners, frequent vacationers, and vacation home owners who want an added aspect of security in their home, at a minimal cost. Talk to your Atlas Home Services technician to learn how you can have this important layer of protection added to our home’s plumbing system!